This is my 5 month old puppy, Jake. He is currently 64 pounds and still growing. Everyone I meet says he is HUGE and I guess he is! I find this really funny because he was only 7 pounds at 8 weeks, and everyone told me he was too small to be a purebred German shepherd. Although we are still waiting for those ears, we don't care. We love our biggie boy just the way he is! Hello Cathy, what a great German Shepherd puppy story. 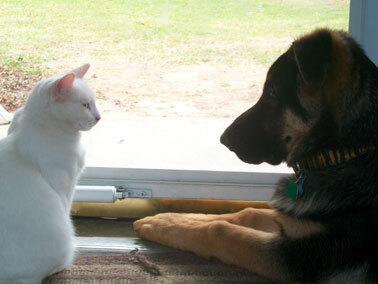 And thank you so much for sharing your great GSD story about your wonderful little German Shepherd puppy and his pet cat. And what a wonderful picture - I absolutely love it! Too cute! Maybe you can send us some more pictures later on with Jake and the kitty. He is absolutely adorable.